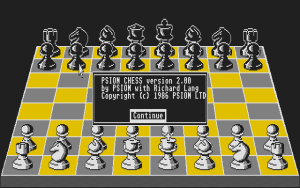 a former commercial chess program developed by Richard Lang as successor of his first program Cyrus. In about 1983 Lang started to write his new program for 68000 based processors in assembly language  , when he was about to abandon the work for Intelligent Software, who owned the Cyrus brand name. Psion was first marketed by Sinclair Research for Sinclair QL  and later under Psion's own label for 68000 based Apple Macintosh and Atari ST homecomputers, in late 1983 ported to 8086 based PCs running under the MS-DOS operating system. Psion was the shared winner of the WMCCC 1984, and also won the Software Event of the WMCCC 1987. Richard Lang's early Mephisto programs, such as the WMCCC 1985 winner Mephisto Amsterdam, were based on Psion  . According to Chris Whittington the chess software for the Psion 3a PDA was written by Ren Wu  . A further Psion Chess program for Psion Series 3 and Psion Siena PDAs was written by Johan Van Barel in C   .
This page was last edited on 9 June 2018, at 19:41.